Writings Of An Autistic Woman: Three Short Poems. Semicolons, curses, and allies. Three Short Poems. Semicolons, curses, and allies. Three short poems for day three of National Poetry Writing Month. I'd love to have more energy to write something following one of the prompts. Never mind. It's been a great day. I decided I would be well and my decision worked well enough that I could go somewhere I've never been before, walk eight miles, and see some great things. I'll get all my photos onto the laptop soon and blog them. They won't be writing blogs but since I haven't managed to post on my other blog at all this year - and added all the old posts to this blog - I might as well post about my little adventures here. For now though three poems. All based, loosely or tightly, on incidents that have affected me over the weekend. The first hit me. I never knew Amy Bleuel but her idea has helped many people including people I do know. I don't like tattoos at all really but even I've been half-tempted. News of her death, by suicide, touched me more than I would have expected. And I think of myself too. For all the times I could have been a full stop. 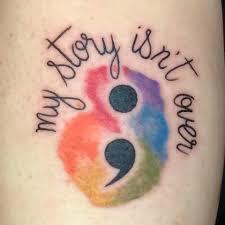 I am a semicolon and I continue. For that I count myself very fortunate indeed. And it's not something I ever want to take for granted. Sad news. Very sad. As I type I am wanting to cry. Though some may hate us. Leads to a warm hearth. And a world smiling with me. There's no such thing as autism. That you all need to listen to.